We can help you reach your target market - whether you're selling aquatic supplies to swimmers, giving lessons to young musical prodigies or offering after-school learning programs. If your business or community group provides products or services that relate to any of our programs or health and fitness activities, advertise with us. Visit our Become a Playcard Advertiser page for more information. The Leisure Guide contains over 150 pages jam-packed with information about staying active in North Vancouver. 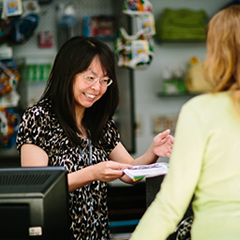 Twice each year, over 16,000 copies of the Leisure Guide are distributed in the City and District of North Vancouver. Place an ad in our Leisure Guide to increase awareness of your business or community group. If you would like to confirm your spot in the Leisure Guide please fill out and return the confirmation form in the Leisure Guide Advertising Booklet. New advertisement design, and any modifications or edits to existing advertisements by our graphic designer will be subject to the design fee. $50 design fee for 1/6, 1/3 & 1/2 page sizes and $100 design fee for a full page size. For more information on our ad specifications, policies and confirmation form check out our Spring/Summer 2019 Leisure Guide Advertising Booklet. Contact Isabelle Laroche by email or by phone at 604-983-6390 for more information about advertising in the Leisure Guide. Interested in arena advertising? Promote your business and support the community by contacting REC Media to discuss the advertising opportunities available in NVRC's arenas. Learn more at REC Media’s website.